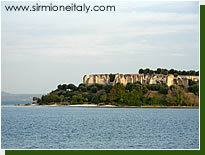 Looking for somewhere to stay in Sirmione? Sirmione has been settled since the Stone Age, with early finds showing that it was probably a small village of fishermen living in houses on stilts on the banks of Lake Garda. Its strategic position near the southeastern "corner" of the lake and the defensive qualities of the peninsula meant that it was of military importance over the years. But the beauty of the setting also meant that it was - and still is - a popular place for people to visit. The "Grotto of Catullus" on the end of the Sirmione peninsula is a bit of a misnomer as it is neither a grotto nor - contrary to what some tourist blurbs would have you believe - did the Roman poet Catullus ever live there. It was originally termed a "grotto" in reference to the run-down and collapsed walls. As far as the history goes, Catullus lived before this building ever existed (although his family did own a villa here). The villa itself is a three-story building from around 150AD (Catullus died in 54BC) and the main sights to be seen are the supports for what was once a patrician villa for a rich family. There is a small museum at the entrance and the site can be visited (entry fee). 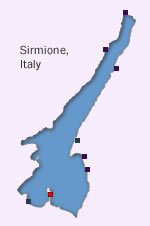 As an important strategic point, Sirmione was continually engulfed in the turbulent history of northern Italy, whether it was through the waves of invasions following the fall of the Roman Empire, the expansion of the Lombards, or the intricate struggles between the Guelphs and the Ghibellines in the Middle Ages (essentially between a political grouping supporting the Pope and one supporting the Emperor). This fortification, surrounded by water, was built near the end of the 12th century as part of a defensive network surrounding Verona. Although the struggles between the Ghibellines and Guelphs featured largely in the history, the original military adventure onto the peninsula was to wipe out the population of Sirmione, who were heretic Cathars and 2,000 of whom were subsequently burned at the stake in the Arena in Verona. The castle was maintained and extended first as part of the Veronese protection against their rivals in Milan and later under the control of the Venetian inland empire. 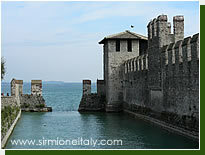 After another fortification was built at nearby Peschiera, the castle lost its importance and was used as a storage depot. It was taken into government ownership at the start of the 20th century. From the fall of the Venetian Republic in the days of Napoleon, the inhabitants of Sirmione enjoyed a less eventful life and were able to concentrate more on the fruit orchards and olive groves on land and the fisheries in the lake. 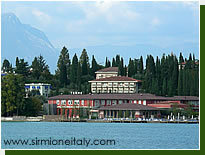 The Terme di Catullo uses the water which bubbles out of Lake Garda near the northern shoreline of the Sirmione peninsula. Metal pipes which supplied the Grotto of Catullo have been discovered in the Roman ruins (in fact, one theory says that it may actually have been a bathhouse and not a villa). The water - mineral-rich and at a temperature of 70°C when it leaves the rock - is used for health treatments in the two thermal baths and spas which exist on the peninsula. The principal one is located on the lakefront northwards from the ferry landing jetty.